Bob Perkins collected and reared a Shadow Darner dragonfly (Aeshna umbrosa) larva/nymph. 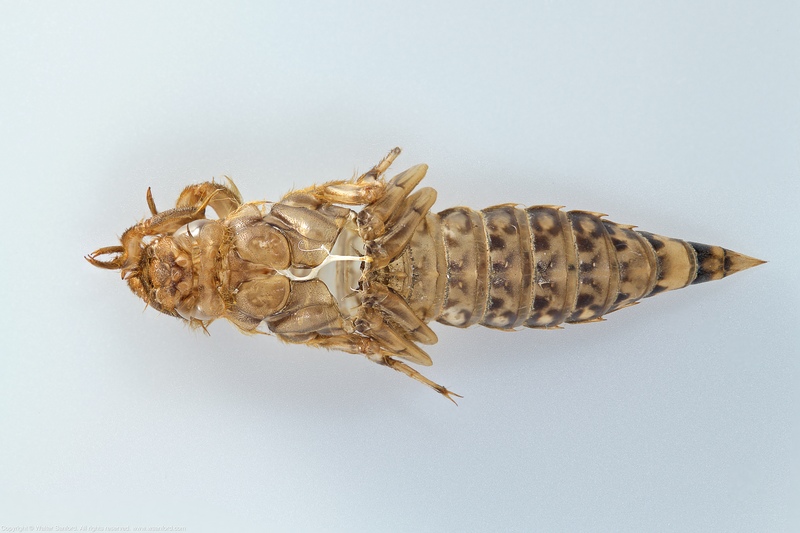 This blog post features two focus-stacked composite images of a beautifully preserved specimen of the adult that emerged from the larva. This individual is a male, as indicated by his terminal appendages and “indented” hind wings (shown above). 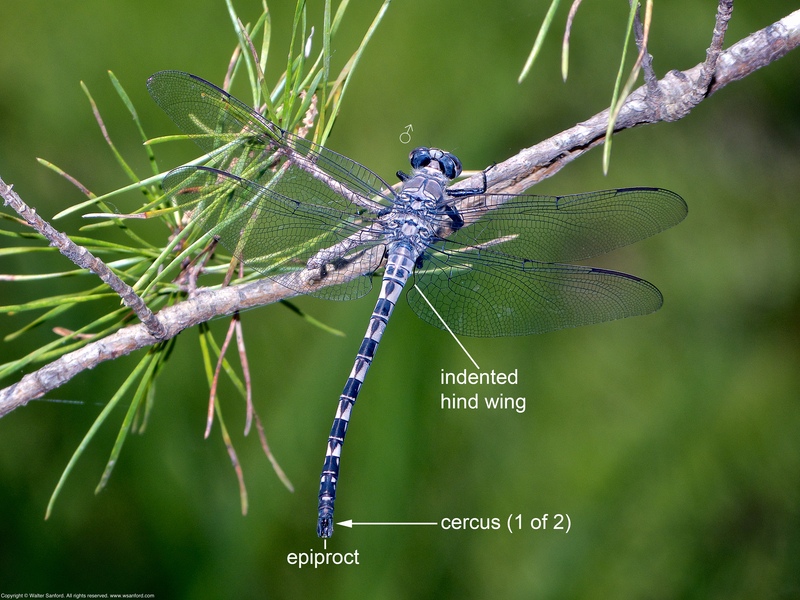 All male dragonflies have three terminal appendages, collectively called “claspers”: the two cerci are missing (they broke off the terminal end of the abdomen during shipping); the epiproct is intact. Perhaps the biggest takeaway from on-going experimentation with Panasonic “Post Focus” is that the process continues to impress — it works quickly (typically one second or so) and works well, using lightweight, inexpensive equipment for making composite images of acceptable quality. What’s not to like? The obvious answer: The image quality isn’t as high as comparable images created using HEAVY and EXPENSIVE camera gear in the controlled environment of a photo studio. On the other hand, I know from experience I’m unlikely to lug all of that gear into the field. I call it a BIG WIN to have found a relatively lightweight, inexpensive camera kit that does essentially the same job almost as well! The next test: Use adult dragonflies in the wild as the subject. Regrettably, that will have to wait until the first odonates begin emerging during early spring. The following equipment was used to shoot the “photos” for creation of the composite images, shown above: Panasonic Lumix DMC-FZ300 digital camera set for “Post Focus“; and two Sunpak LED-160 Video Lights. 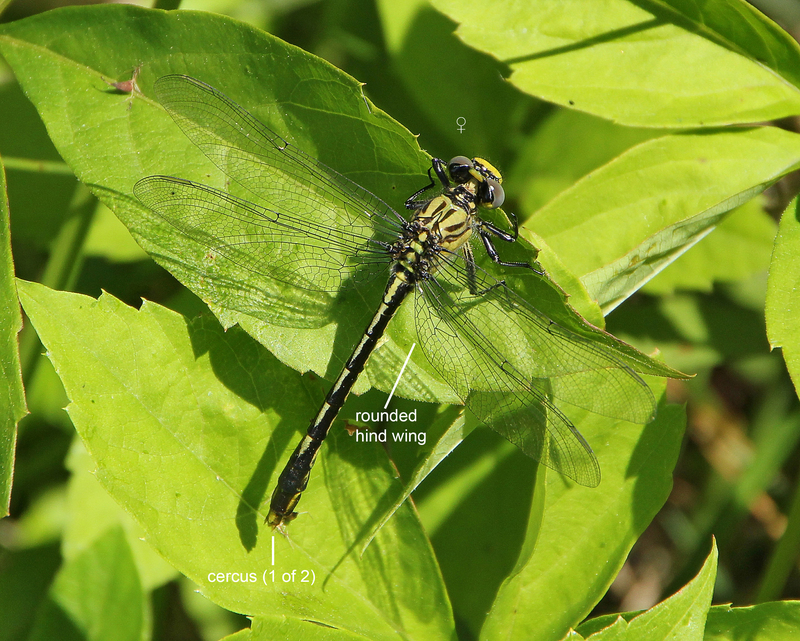 Two field markers can be used to identify female Unicorn Clubtail dragonflies (Arigomphus villosipes), as shown in the following annotated image: 1) they have two terminal appendages (cerci) rather than three (males); and 2) their hind wings are rounded rather than “indented” (males). Image used with permission from Bob Blakney. 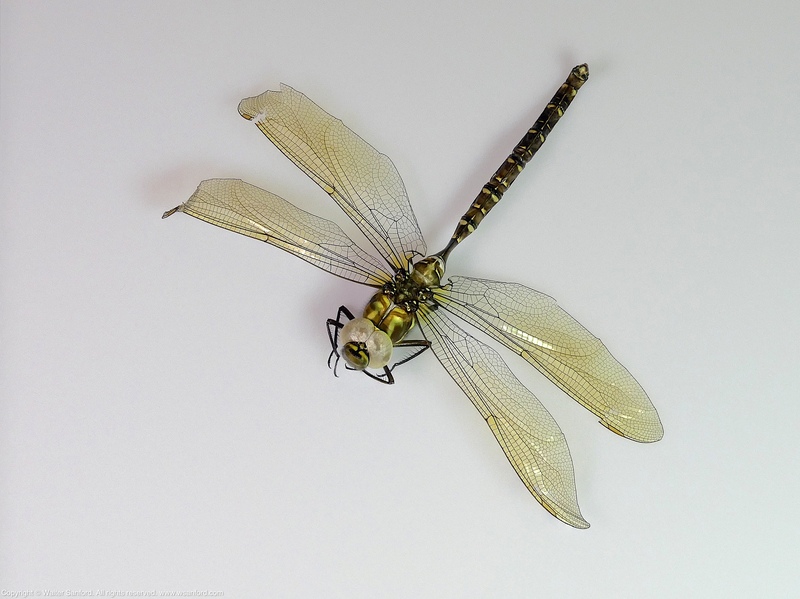 In my experience, female Unicorn Clubtail dragonflies are seen uncommonly. Sincere thanks to Bob Blakney for kindly granting permission to use his excellent photograph of this uncommon beauty for instructional purposes. Bob’s photo was taken on 18 May 2012 at Occoquan Bay National Wildlife Refuge using a Canon EOS Rebel T2i digital camera and Tamron AF 18-270mm macro lens. 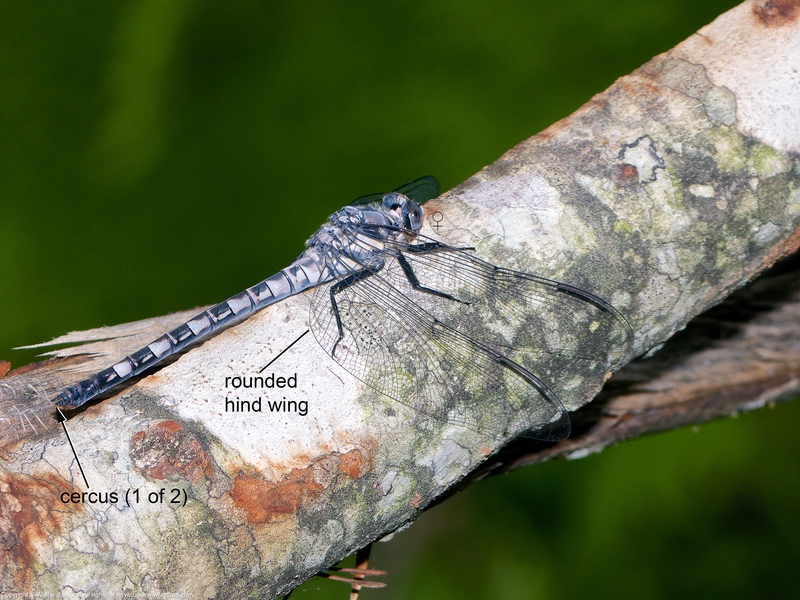 “Bender,” my nickname for a male Gray Petaltail dragonfly (Tachopteryx thoreyi) with a malformed abdomen, is featured in the following set of annotated photos. Gray Petaltail males have “indented” hind wings, as shown in the last photo. 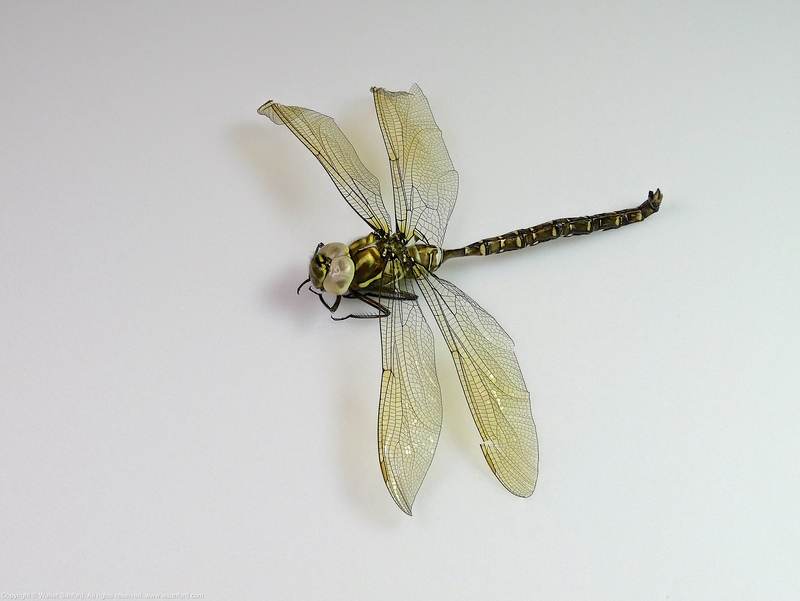 For those species of dragonflies that do not display sexual dimorphism, males and females are nearly identical in appearance except for their terminal appendages. For example, male and female Gray Petaltail dragonflies (Tachopteryx thoreyi) are similar in appearance. Two field markers can be used to identify female Gray Petaltails, as shown in the following annotated images: 1) they have two terminal appendages (cerci) rather than three (males); and 2) their hind wings are rounded rather than “indented” (males). 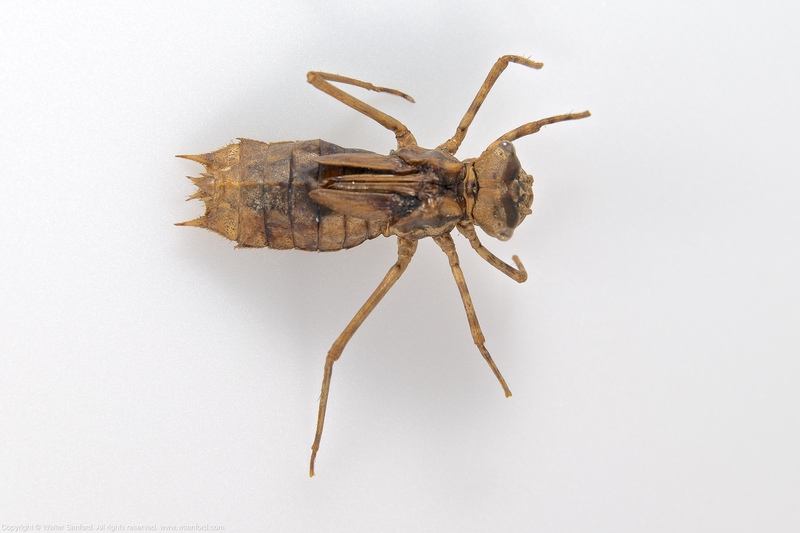 An odonate exuvia was collected by Michael Boatwright, founder and administrator of the Virginia Odonata Facebook group, on 07 June 2018 at Otter Lake in Amherst County, Virginia USA. A two-step process was used to identify the genus and species of the specimen. Determine the genus and species. First, determine the family of the specimen. 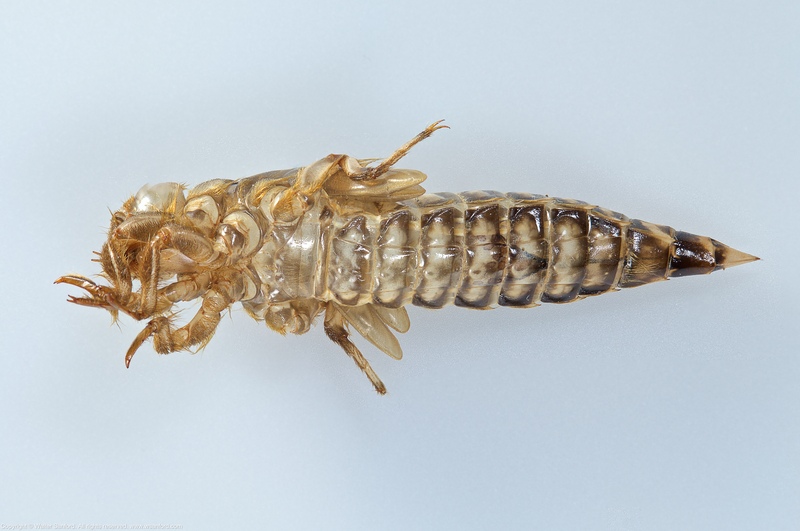 For reference, watch the excellent Vimeo video, Identifying dragonfly larva to family (8:06). Here’s the decision tree used to identify the exuvia as a member of the Family Corduliidae (Emeralds). 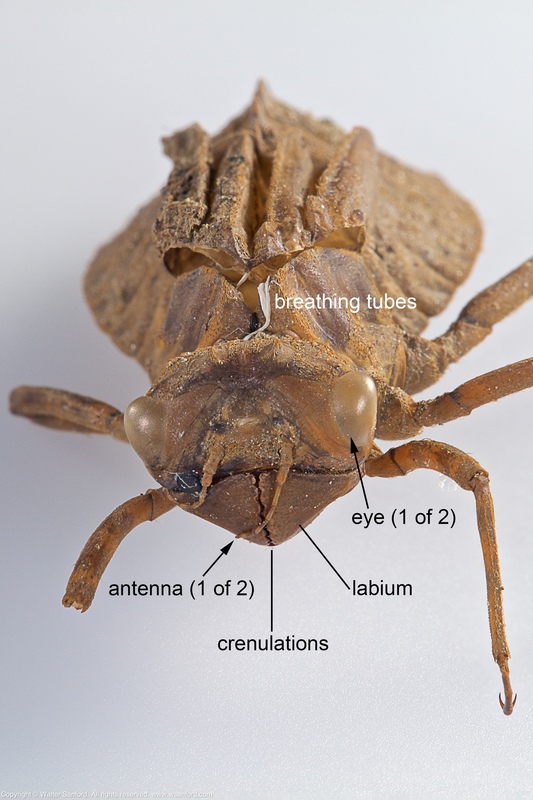 The specimen has a mask-like labium (prementum) that covers the face, as shown in Image No. 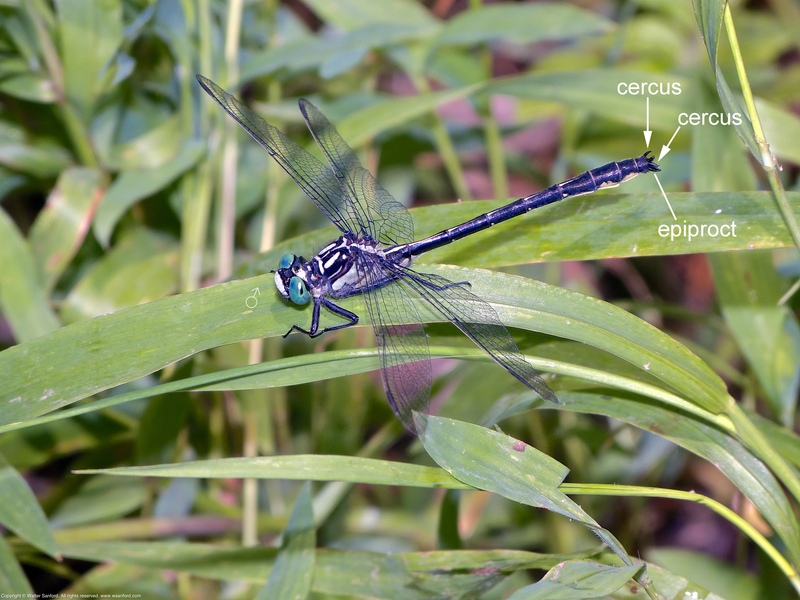 1, characteristic of four families of odonates: Cordulegastridae (Spiketails); Corduliidae (Emeralds); Libellulidae (Skimmers); and Macromiidae (Cruisers). 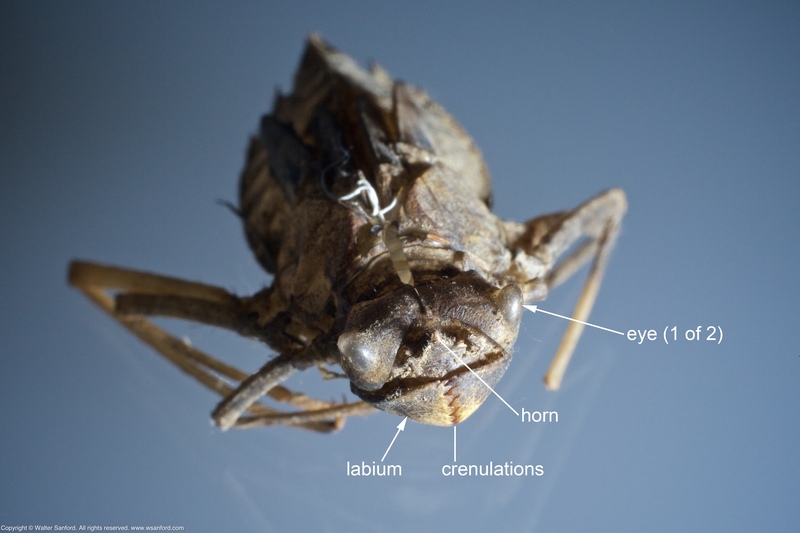 There is no horn on the face-head, characteristic of Macromiidae, so it’s not a cruiser. Cordulegastridae has jagged crenulations on its labium, so it’s not a spiketail. 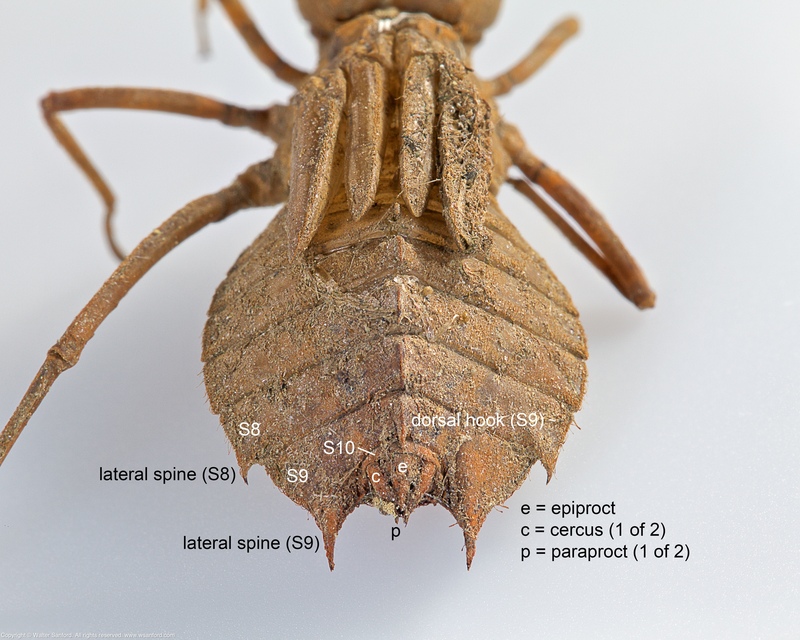 The crenulations for Corduliidae and Libellulidae look similar. 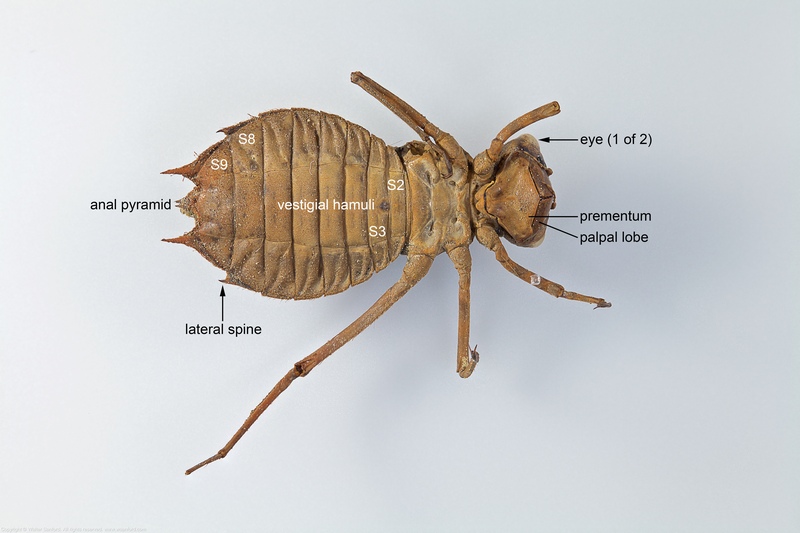 In summary, the exuvia has a mask-like labium with relatively smooth crenulations, no horn on its face-head, and the cerci are more than half as long as the paraprocts, confirming that the specimen is a member of Family Corduliidae (Emeralds). 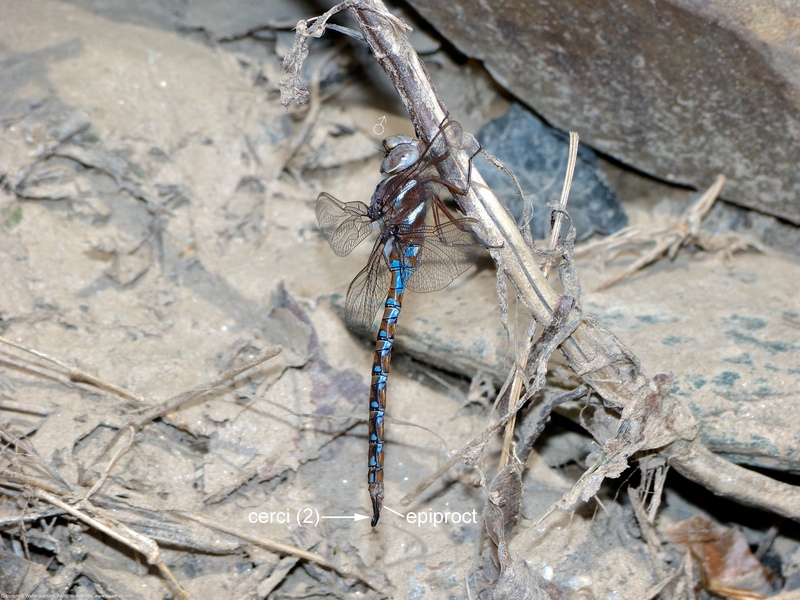 Characters from two dichotomous keys were used to identify the genus and species: Prince Baskettail dragonfly (Epitheca princeps). 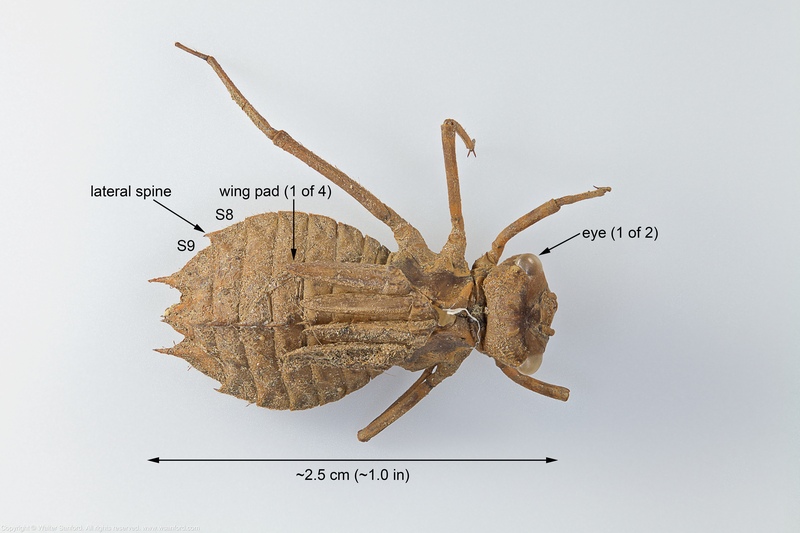 See Epitheca princeps exuvia, another of my illustrated guides to identification of odonate exuviae, for a detailed explanation of the decision tree used to identify the genus and species of this specimen. This individual is a male, as indicated by the vestigial hamuli visible on the ventral side of abdominal segments two and three (S2-3). Notice the cerci are at least half as long as the paraprocts, as shown in Image No. 4. Image No. 5 shows a dorsal-lateral view of the mid-dorsal hooks. I really wanted this specimen to be Stream Cruiser dragonfly (Didymops transversa). 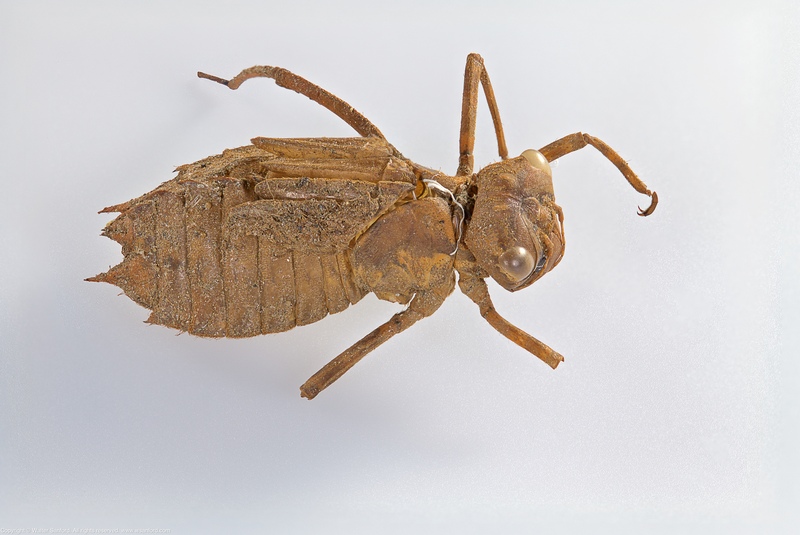 I think exuviae from D. transversa and E. princeps are similar in appearance — an opinion not shared by at least one expert on identification of odonate exuviae. Two characters proved to be the deal-breaker that forced me to abandon D. tranversa in favor of E. princeps. 1) The specimen does not have a horn on its face-head. 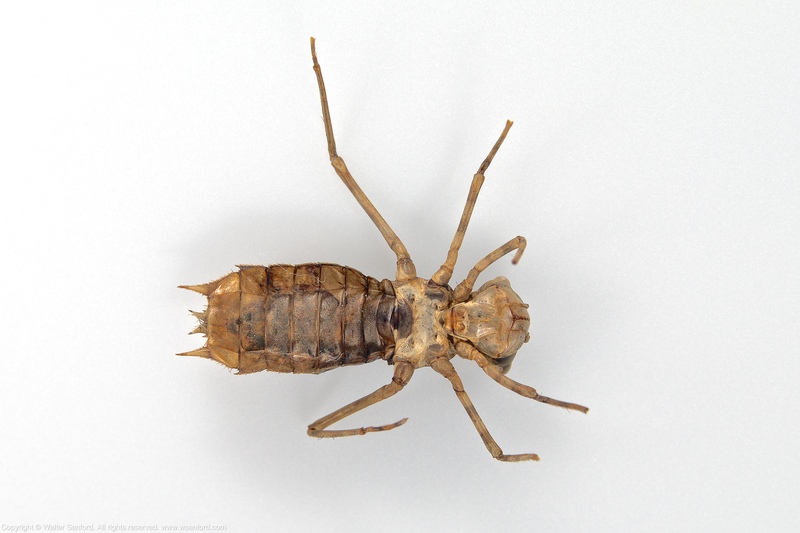 2) This specimen is only 25 mm long (2.5 cm); D. transversa larvae/exuviae are 30 mm long (3.0 cm), according to Dragonflies of North America, Needham, James G., et al. The following equipment was used to shoot Image No. 1-5: Canon EOS 5D Mark II digital camera, in manual mode; Kenko 20mm macro automatic extension tube; Canon EF100mm f/2.8L Macro lens (set for manual focus); Canon MT-26EX-RT Macro Twin Lite set for “Master” mode, and Canon 580 EX- and Canon 580EX II Speedlites set for “Slave” mode. Image No. 1-5 are focus-stacked composite images created and annotated using Adobe Photoshop CC 2017: Image No. 1 (7 photos); Image No. 2 (22 photos); Image No. 3 (19 photos); Image No. 4 (10 photos); Image No. 5 (20 photos). 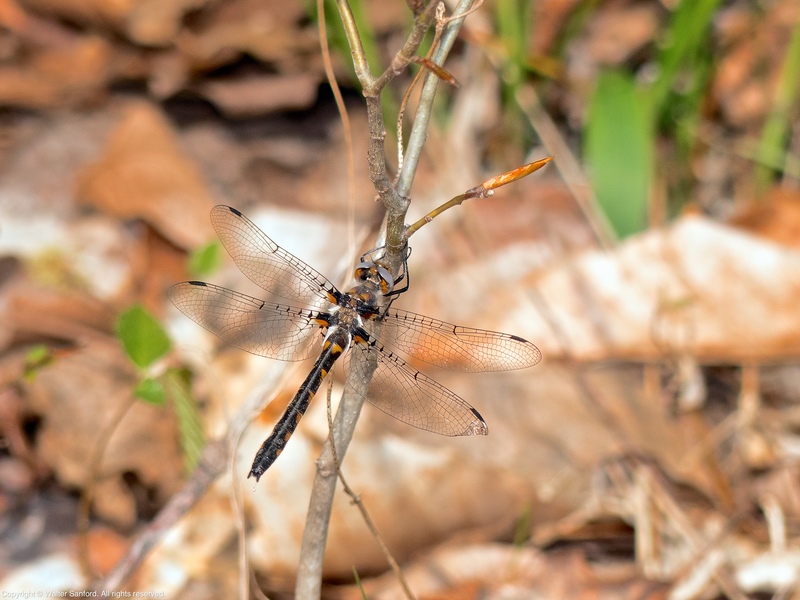 Male and female Sable Clubtail dragonflies (Stenogomphurus rogersi) were spotted recently in Fairfax County, Virginia USA. 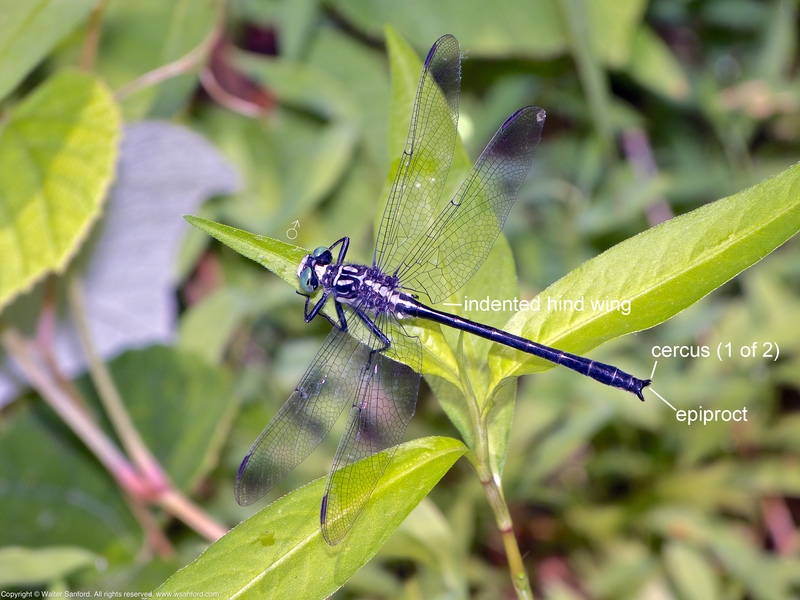 Male dragonflies have three terminal appendages, collectively called “claspers,” that are used to grab and hold female dragonflies during mating: an upper pair of cerci (“superior appendages”); and a lower unpaired epiproct (“inferior appendage”). 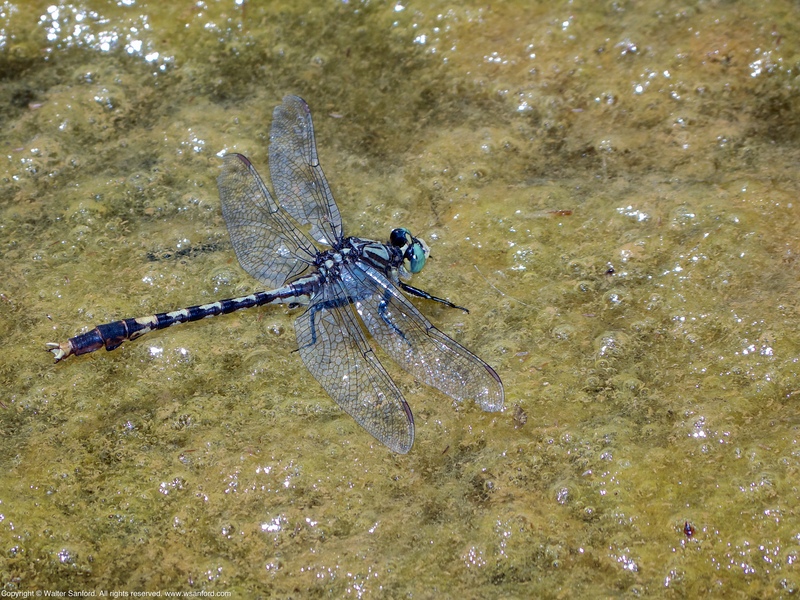 The epiproct for Sable Clubtail is essentially a wide plate with two prongs. 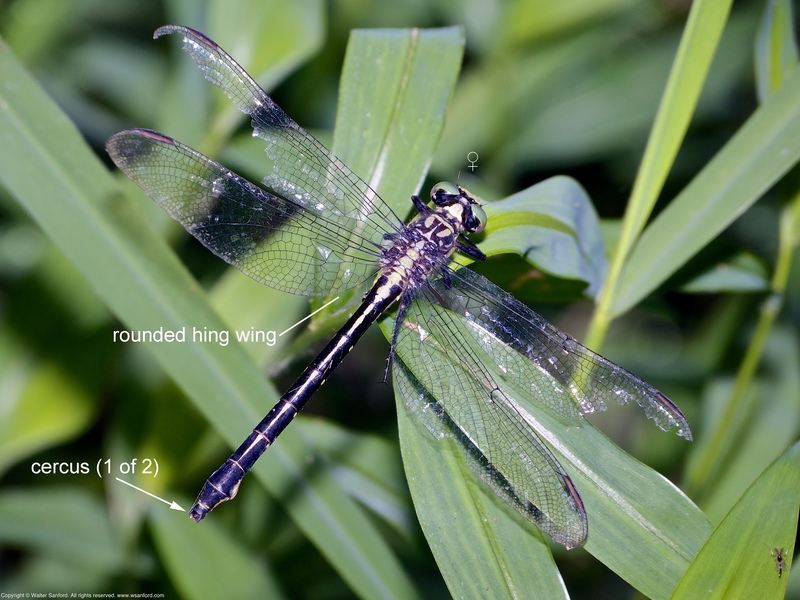 The hind wings of male clubtail dragonflies are “indented” near the body, as shown in the preceding photograph. In contrast, the hind wings of female clubtails are rounded (shown below). 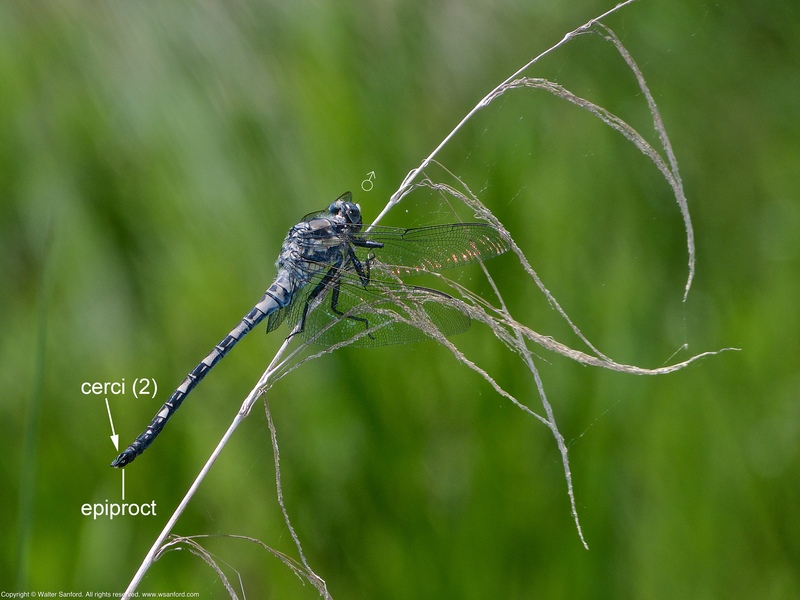 Female dragonflies have a pair of cerci (superior appendages) that have little or no function. The abdomen of female Sable Clubtails is noticeably thicker than males of the same species. A Springtime Darner dragonfly (Basiaeschna janata) was spotted along Popes Head Creek at Hemlock Overlook Regional Park (HORP) in Fairfax County, Virginia USA. 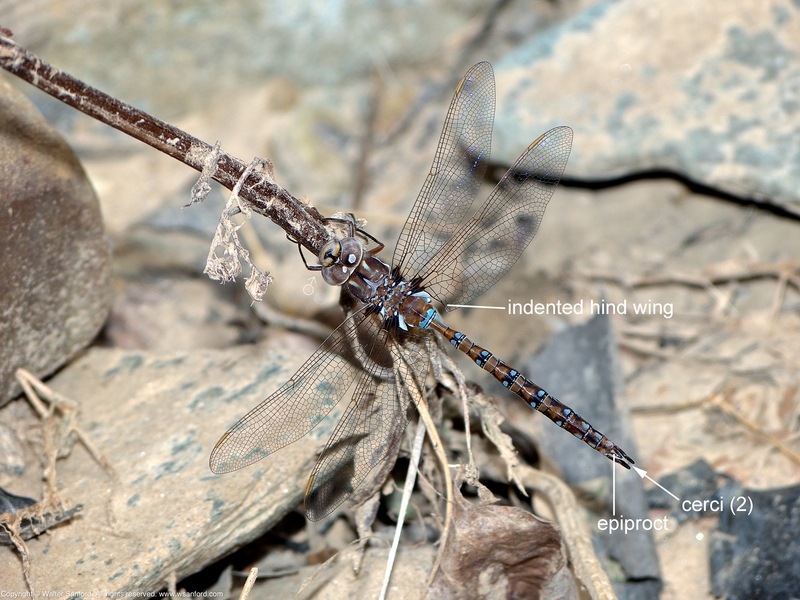 This individual is a male, as indicated by his terminal appendages and “indented” hind wings. The preceding photos are new, that is, previously unpublished. Both photos are full-frame (uncropped). Springtime Darners can be quite skittish. In this case, I was very close to an unusually cooperative model. The last photo was shot using Aperture Priority. I prefer shooting in Shutter Priority, but I like to shoot a few shots using Aperture Priority whenever I can use either a monopod or tripod. In this situation, I improvised. In addition to my photography gear, I usually carry a Coleman camp stool when I go photowalking. 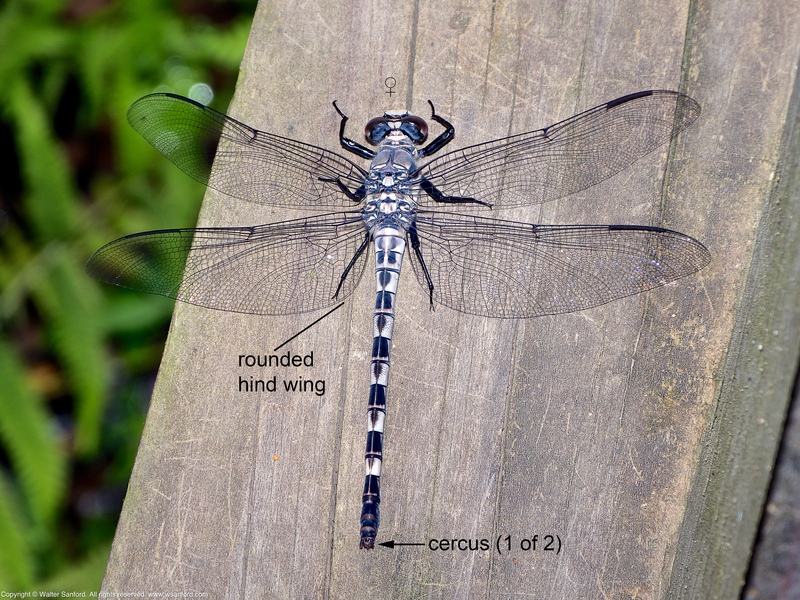 The small, lightweight folding chair is good for resting while waiting for “the game to come to me.” The camp stool also enables me to get closer to subjects either on- or near the ground, such as the Springtime Darner featured in this blog post. I think it’s easier to hold my camera rock-steady when I’m sitting on the chair with my elbows resting on my knees.